Maxwell M. Scherzer (born July 27, 1984) is an American professional baseball pitcher for the Washington Nationals of Major League Baseball (MLB). Nicknamed “Mad Max”, he made his MLB debut as a member of the Arizona Diamondbacks in 2008, and later played for the Detroit Tigers. He has been an important figure in the both the Tigers' and Nationals' playoff presence, including Detroit's four consecutive American League Central titles from 2011−2014 and two of Washington's National League East titles. A power pitcher with a low three-quarter-arm delivery, Scherzer has achieved numerous strikeout records, while becoming the tenth pitcher in history to be awarded at least three Cy Young Awards, the sixth to record two no-hitters in one season, the fifth to produce more than one immaculate inning, and the fourth to strike out at least 200 batters in a season seven years in a row. 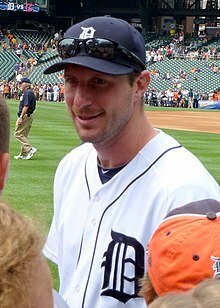 The Diamondbacks selected Scherzer, a native of Greater St. Louis, in the first round and 11th overall of the 2006 amateur draft from the University of Missouri. He is a six-time MLB All-Star, and the fifth pitcher to start an All-Star Game for both American and National Leagues. He is a winner of three strikeout titles, a four-time wins leader, and a four-time walks plus hits per inning pitched (WHIP) leader. In addition to three Cy Young Awards, he also finished fifth in its voting in 2014 and 2015. One the most consistent hurlers of his era, he has made at least 30 starts each season from 2009–2018, and struck out at least 230 batters in each season from 2012–2018. Prior to the 2015 season, Scherzer agreed to a seven-year, $210 million contract with the Nationals, one of the largest in baseball history. During his major league debut, Scherzer established the record for most consecutive hitters retired in a relief appearance as a major league debut with 13. He became the third pitcher to start a season with a 19–1 win–loss record, on the way to winning his first Cy Young Award in 2013. In 2015, Scherzer became the sixth pitcher in Major League history to record multiple no-hitters in a single season, including the first with at least 17 strikeouts and no bases on balls, and the first to accrue a game score of 100 or more twice in one season. On May 11, 2016, he tied the major league nine-inning strikeout record with 20, making him the second player to achieve both a no-hitter and 20 strikeouts over nine-innings. In 2017, he became the third-fastest hurler to record 2,000 strikeouts, and the fourth to strike out 250 or more in four consecutive seasons. Scherzer has more strikeouts (2,449) than any pitcher in the 2010s. He recorded one immaculate inning each in 2017 and 2018. Scherzer was born and raised in Chesterfield, Missouri, the son of Jan (Shirck) and Brad Scherzer, and grew up a St. Louis Cardinals fan. He attended and played baseball, football, and basketball at Parkway Central High School in his hometown, where he powered through any gap in talent for the games with a fiercely competitive nature that would become a distinctive trademark throughout his athletic career. One of his strongest high school coaching influences was basketball coach Rick Kirby, who stressed fundamentals and was defense-oriented; Scherzer is also likely Kirby's most successful athletic pupil. Marty Maier, then the Cardinals' scouting director, was impressed enough to select him in the 43rd round (1,291st overall) of the 2003 Major League Baseball (MLB) draft. However, he did not sign, and instead attended the University of Missouri in Columbia, also known as "Mizzou". One of Scherzer's coaches at Mizzou, Tony Vitello, was tasked with helping to recruit him, and eventually helped him to pitch with more balance and control and to stop leaping at hitters, which frequently caused him to miss up and in to right-handed batters. Ever energetic, in his early baseball career Scherzer exerted so much effort in his windup that his "head whip" constantly caused his cap to fall off. He did not pitch the final 50 days of his freshman season, instead working out and doing long toss, while gaining velocity in the process. Vitello and head coach Tim Jamieson trained him in a drill to balance on his back leg with more coordination and not to fall over his front foot. Scherzer modified it and worked constantly over the following the winter, and returned his sophomore year to produce a 1.86 earned run average (ERA) and 131 strikeouts in 106 innings pitched over 16 games. In 2005, he won the Big 12 Pitcher of the Year Award. The Arizona Diamondbacks chose Scherzer in the first round and 11th overall in the 2006 MLB draft, making him Mizzou's first-ever MLB first-round draft pick. On January 9, 2012, it was announced that Scherzer would be one of six new inductees to the University of Missouri Intercollegiate Athletics Hall of Fame. Following his freshman year at the University of Missouri, in 2004, Scherzer made his debut with the La Crosse Loggers of the Northwoods League (NWL), a collegiate summer baseball league. He went 2–1 that summer with a 1.91 ERA with six saves. He also struck out 50 batters in only 33 innings pitched. He was named a mid-season All-Star. The Arizona Diamondbacks chose Scherzer in the first round with the 11th overall pick of the 2006 MLB draft. Mike Rizzo, the Diamondbacks' scouting director, marveled that Scherzer attacked hitters with a relentlessness that he had never seen. Eight pitchers were selected ahead of him, including Luke Hochevar (first overall pick), Brandon Morrow, Clayton Kershaw, and Tim Lincecum. Scouting reports criticized Scherzer for too violent of a delivery, but Rizzo and other Arizona scouts decided that "the combination of his arm action and his pitching IQ and his attack mode ... we were calling him 'Mad Max' in the draft room. He came at you. He looked angry. He looked mad." However, Scherzer and his agent, Scott Boras, at first failed to reach an agreement with the club. Thus, Scherzer began his professional baseball career with the Fort Worth Cats of the independent American Association. After appearing in three games, he signed a four-year, $4.3 million contract with the Diamondbacks. He began playing in the Diamondbacks organization in 2007 with the Single-A Visalia Oaks. He was promoted to Double-A Mobile BayBears after three impressive starts for the Oaks. During the 2008 offseason, he was named the fourth-best prospect in the Diamondbacks organization. After a good start to the 2008 season in Triple-A Tucson he was called up to the Diamondbacks on April 27, 2008. On April 29, 2008, Scherzer made his MLB debut against the Houston Astros when he came on in relief and threw 4​1⁄3 perfect innings while striking out seven. While doing so he set the record for the number of consecutive batters retired (13) for a pitcher making his MLB debut as a reliever. The previous record was 12 set in 1962 by the Los Angeles Dodgers' Pete Richert. The seven strikeouts were one short of the major-league record for most in a debut relief appearance. The Pittsburgh Pirates' Barry Jones had eight on April 20, 1986. On April 30, 2008, the Diamondbacks announced he would be placed into the starting rotation, due to his impressive debut. In his first appearance as a starter for the D-Backs, Scherzer allowed five runs (two earned) in four innings, while striking out five, taking the first loss of his major league career. He returned to the bullpen for much of the 2008 season. He started against the Cardinals on September 24 and lost for the fourth time in his career in a winless season, going five innings, allowing seven hits and four runs (two earned) while walking two and striking out four. Scherzer participated in the 2008 Arizona Fall League season as member of the Phoenix Desert Dogs. Scherzer became a full-time starter in 2009, filling the fifth starter role in the starting rotation. He recorded his first major league victory in a 12–0 win over the Atlanta Braves on May 16, 2009. On May 26, Scherzer recorded his second win of his career. He finished the 2009 season with 30 starts, a 9–11 record, 4.12 ERA, and 174 strikeouts in 170⅓ innings pitched. After the 2009 season, Scherzer worked out in Fort Collins, Colorado, with the Colorado State University baseball team. On December 9, 2009, Arizona traded Scherzer along with Daniel Schlereth, Phil Coke, and Austin Jackson to the Detroit Tigers as part of a three-team agreement that sent Ian Kennedy and Edwin Jackson to the Diamondbacks and Curtis Granderson to the New York Yankees. In Detroit, Scherzer materialized from formidable strikeout artist into an ace to team with fellow right-hander Justin Verlander to front the starting rotation together for a period of five seasons and four consecutive playoff appearances. Their achievements culminated in winning the 2012 American League (AL) pennant, only to fall to the San Francisco Giants in the World Series. They missed the playoffs with a third-place finish in 2010, Scherzer's first season with the Tigers, but won the AL Central division each of the following four seasons. Detroit optioned Scherzer to the Triple-A Toledo Mud Hens on May 16, replacing him with Armando Galarraga. Shortly thereafter, Scherzer was recalled to the major leagues for good, going 6–4 in twelve starts with an ERA of 2.62 and 85 strikeouts in 75​2⁄3 innings. On May 30 versus the Oakland Athletics, Scherzer accumulated 14 strikeouts in ​5 2⁄3 innings pitched. It was the fourth time in his career that he had 10 or more strikeouts in a single game. He allowed two hits, four walks, and hit a batter on his last pitch. That mark was tied for the most strikeouts in Comerica Park history with Jeremy Bonderman, and tied for second in franchise history behind Mickey Lolich, who had 16 strikeouts in one game. On July 26, Scherzer and Tampa Bay Rays pitcher Matt Garza dueled for a no-hitter into the sixth inning. After ​5 2⁄3 hitless innings, Scherzer lost the no-hit bid, shutout, and game after serving up a grand slam to Matt Joyce. Meanwhile, Garza opportunely secured the no-hitter in a 5–0 Tampa win. Scherzer struck out eight. On September 1 against the Minnesota Twins, Scherzer pitched into the ninth inning for the first time in his career. He gave up one run on four hits and one walk while striking out nine on 107 pitches, though he received a no-decision as the Tigers lost the game in the tenth inning. Scherzer finished the 2010 season with a 12–11 record, 3.50 ERA and 184 strikeouts. Despite spending some time in the minor leagues, his strikeout total was still good for tenth in the American League. In the 2011 season, Scherzer was the third starter in the rotation, and won six straight starts early in the year, being the first Tiger since Jeremy Bonderman in 2006 to accomplish this feat. Scherzer finished the season with a 15–9 record, and was third in the AL in home runs allowed (29), fourth in wild pitches, fifth in hits by pitch (10), ninth in winning percentage (.625), and tenth in wins. On May 20, 2012, Scherzer struck out 15 Pittsburgh Pirates in seven innings, falling one strikeout short of tying Lolich's franchise record. Scherzer surpassed the 200-strikeout mark for the first time, totaling 231 during the regular season to place second in the league to teammate Verlander with 239. Scherzer's strikeout rate per nine innings (11.1) both surged into the double-digit range and led the AL for the first time. He finished the regular season with other then-personal bests in wins and winning percentage (16–7, .696). In four seasons spanning 2009−12, Scherzer went 52−38, 3.94 ERA, 1.302 WHIP, averaging 9.2 strikeouts per nine innings and 191 strikeouts per season. Despite battling a late-season injury, Scherzer pitched successfully for the Tigers in the 2012 postseason, after they had won the AL Central division. He made three starts, going 1–0 with a 2.08 ERA, while striking out 26 batters over 17​1⁄3 innings. The Tigers reached the World Series, for the first of Scherzer's career, and opposed the San Francisco Giants. He started Game 4, yielded three earned runs in 6​1⁄3 innings while striking out eight batters, and received a no-decision as the Tigers lost the game in extra innings, 4−3. After a win against the Tampa Bay Rays on June 28, 2013, Scherzer became the first Tigers pitcher to ever start a season 12–0, surpassing the 11–0 start from George Mullin in 1909. With a win against the Toronto Blue Jays on July 3, Scherzer also became the first major league starter to begin a season 13–0 since Roger Clemens in 1986. The streak ended with a loss to the Texas Rangers on July 13. On July 1, Scherzer was selected by player vote to represent the American League in the 2013 All-Star Game, his first major league All-Star selection. On July 15, Jim Leyland, who managed the AL All-Star team this season and was also the Tigers manager, announced that he had chosen Scherzer as the AL's starting pitcher. Entering the All-Star break, Scherzer had a 13–1 record, 3.19 ERA, 0.98 WHIP and 152 strikeouts in ​129 2⁄3 innings pitched. He pitched a perfect 1-2-3 inning in the game, including striking out Joey Votto for one of three outs. On August 8, Scherzer recorded his 1,000th career strikeout when he fanned Jason Kipnis of the Cleveland Indians. With a win over the New York Mets on August 24, Scherzer became the third pitcher in major league history to start a season 19–1, following Clemens in 2001 and Rube Marquard in 1912. On September 20, after a 12–5 win over the Chicago White Sox, Scherzer became the first major league pitcher to reach 20 wins. Scherzer became the second Tigers pitcher to reach 20 wins since Bill Gullickson in 1991, following Verlander in 2011, and the 45th in Tigers history. He finished the regular season at 21–3, with a league-leading 0.97 WHIP, 2.90 ERA, and a career-high 240 strikeouts. He was the only 20-game winner in the majors in 2013. Scherzer's stellar season earned him the 2013 AL Cy Young Award, receiving 28 of 30 first-place votes. He also was the winner of the Players Choice Award for AL Outstanding Pitcher, and the Baseball Digest Pitcher of the Year—bestowed annually to one pitcher in the major leagues. Scherzer cultivated a dominant performance in Game 1 of the 2013 ALDS versus the Oakland Athletics, recording 11 strikeouts and giving up just one hit through the first six innings, before surrendering a two-run homer to Yoenis Céspedes. He finished with seven innings pitched, giving up three hits, as he and the Tigers won the game, 3–2. He struck out each of Josh Donaldson, Brandon Moss, and Josh Reddick twice. Scherzer was in line to make a Game 5 start in the same series, but facing elimination in Game 4, manager Jim Leyland chose to bring him in as a reliever in the seventh inning. Scherzer gave up the go-ahead run in the top of the inning, but the Tigers regained the lead in the bottom of the frame. Scherzer then loaded the bases with no outs in the top of the eighth, but wriggled out of trouble by striking out Josh Reddick and Stephen Vogt, then getting Alberto Callaspo to line out to center field. The Tigers won the game, and Scherzer earned the victory to go to 2–0 in the series. Scherzer continued his brilliance into the 2013 ALCS against the eventual World Series champion Boston Red Sox. In Game 2, he no-hit Boston for ​5 2⁄3 innings before surrendering two hits and a run in the bottom of the sixth. He left the game with a 5–1 lead after seven innings, striking out 13. However, a quartet of Tiger relievers blew the lead in the eighth inning, and Boston won it, 6–5, on a walk-off single in the ninth. Scherzer was the losing pitcher in the Tigers' 5–2 loss in Game 6, the deciding and final game of that series. On January 17, 2014, Scherzer and the Tigers agreed on a $15.525 million salary for the 2014 season, avoiding arbitration for the third straight year. On May 5, Scherzer struck out nine Houston Astros batters in eight innings of a 2–0 victory. It was his seventh straight game from the start of the season with at least seven strikeouts, establishing a Detroit Tigers franchise record. The streak ended on May 10 against the Minnesota Twins, when he struck out six batters in six innings. The Major League record for consecutive 7+ strikeout games to start the season is nine, accomplished by Bob Feller in 1946. On June 12, in his 179th career start, Scherzer consummated both his first career complete game and shutout in a three-hit, 4–0 win versus Chris Sale and the Chicago White Sox. Scherzer struck out eight batters and expended 113 pitches in the contest. It was the longest expanse any major league starter had gone without a complete game since 1900. On 18 previous occasions he had endured at least eight innings, including one for nine that eventually required extra innings to finish, precluding credit for a complete game. On July 6, Scherzer was named to his second AL All-Star team by way of manager John Farrell's selection. He pitched a scoreless fifth inning, surrendered a double to Troy Tulowitzki, and struck out Yasiel Puig and Paul Goldschmidt. Scherzer earned the win for the AL. Scherzer finished the 2014 season with an 18–5 record, 3.19 ERA and 1.175 WHIP. New career bests prevailed, including in innings (​220 1⁄3) and strikeouts (252). His 18 wins tied for the AL lead along with Corey Kluber and Jered Weaver. Max made his only postseason appearance of 2014 in Game 1 of the ALDS against the Baltimore Orioles. He was tagged with the loss after surrendering five runs (all earned) in ​7 1⁄3 innings. On January 21, 2015, Scherzer agreed to a contract with the Washington Nationals, now led by Rizzo as general manager. The contract was for seven years and $210 million ($222.0 million today), and included a $50 million signing bonus to be paid out over 14 years, the largest deferral in MLB history. At the time, Scherzer owned a 91–50 W–L with a 3.58 ERA in seven seasons with Arizona and Detroit. On January 22, it was reported that the contract also specified for Scherzer's salary to be $10 million in 2015, and $15 million in each of the next three seasons. It then increases to $35 million a year in 2019, 2020 and 2021, the seasons in which his deferrals begin. In addition, his contract also includes several award bonuses. He would receive $250,000 for winning a Cy Young, MVP or World Series MVP award, $150,000 if he's the MVP of the League Championship Series and $100,000 if he makes the All-Star team, wins a Gold Glove or wins a Silver Slugger award. The contract did not contain a no-trade clause. Scherzer made his regular season debut for the Nationals as their Opening Day starting pitcher versus the New York Mets on April 6, 2015. He struck out eight over ​7 2⁄3 innings in a 3–1 loss. On June 14, 2015, he pitched his second career complete game, ceding one hit and one walk in a 4–0 shutout against the Milwaukee Brewers at Miller Park. He accrued six perfect innings before Carlos Gómez, leading off the seventh inning, fought off a 96 miles per hour (154 km/h) fastball for a bloop single to right field inches past the outstretched glove of second baseman Anthony Rendon. Scherzer's 16 strikeouts established a new personal best and a Nationals team record for one game, surpassing Stephen Strasburg's effort of 14 versus the Pittsburgh Pirates on June 8, 2010. Rated with a game score of 100, Scherzer's was the 12th time in MLB history such a score or higher had been achieved. Six days later, Scherzer no-hit the Pirates 6–0 at Nationals Park for his first career no-hitter. After retiring the first 26 batters, he came to within one strike of a perfect game, only to hit the 27th batter, José Tábata, who appeared to lean into the pitch. Scherzer secured the no-hitter by retiring the next batter, Josh Harrison, on a fly ball. This was the 13th time that the 27th and presumably final batter disrupted a perfect game in progress. The game score was 97, the second occasion on the season where Scherzer had achieved a game score of at least 97. It was a feat previously accomplished just twice, first by Nolan Ryan in 1990 and then Pedro Martínez in 2000. The 100th win of Scherzer's career occurred on June 26 in a 5–2 victory versus the Philadelphia Phillies, where he allowed both runs over eight innings. It was his third consecutive start where he did not allow any baserunners for the first five innings. In June, Scherzer's ERA was 1.79 during which he was named NL Pitcher of the Month for the second consecutive month. Spanning his last three starts of June, he registered 24 consecutive scoreless innings, retired 52 consecutive batters without allowing a hit, struck out 33, and completed 26 of a possible 27 innings. Scherzer was selected to that year's All-Star Game via players' vote. However, he was unavailable for the game as he had already started on the Sunday before the All-Star break. Prior to that start, his season totals included a 2.12 ERA, 143 strikeouts, and two complete game shutouts. Over a winless streak of seven starts beginning July 30, Scherzer allowed a 6.08 ERA, seven walks, 11 home runs, a .305/.335/.587 line against and struck out 53 in 40 innings pitched. He earned his 12th win of the season versus Miami on September 14 with eight shutouts innings in a 5–0 win. On October 3, Scherzer achieved his second career no-hitter, and second of the season, versus the Mets, striking out a new career-high 17 batters with no walks. The only base runner permitted was via a throwing error by Yunel Escobar in the sixth inning. Several baseball analysts and pundits debated the game as one of the greatest pitching performances of all time, and perhaps the most dominant no-hitter ever pitched, based on the number of strikeouts, lack of walks issued or hit batters, and sheer mastery of the opposing batting order the third time through the lineup. At one point, Scherzer had struck out nine consecutive Mets, just one shy of the Major League record set by Tom Seaver in 1970. It tied Ryan for most strikeouts in a no-hitter, was the first no-hitter produced with at least 17 strikeouts and no walks, and made Scherzer the sixth pitcher in MLB history to record multiple no-hitters in one season. With a game score of 104, it was the second-highest achieved on record, and made Scherzer the first to achieve multiple game scores of at least 100 in the same season. That game was singled out for the 2015 Esurance MLB Award for Best Performance. Of Scherzer's three most brilliant performances that season, one tweet adduced that he "was a bloop single, an over-sized elbow pad, and a throwing error away from throwing three perfect games." That description was nearly precise; however, in the June 14 contest versus Milwaukee, Scherzer also issued a bases on ball to Scooter Gennett after allowing Gómez' single—leaving Scherzer four batters short of three perfect games. Thus, he became the first to assemble three games scores of 97 or higher in one season since at least 1914. Ryan and Walter Johnson (1918) were the only two other pitchers to carry out three game scores of 95 or more in one season. In a season that also featured mammoth offensive accomplishments from NL Most Valuable Player (MVP) Bryce Harper, the Nationals were eliminated from the playoff contention with a week remaining. Scherzer finished the 2015 season with a 2.79 ERA and 0.92 WHIP, while striking out 276 batters against only 34 walks for an MLB-leading 8.12 K:BB ratio. He also led all major league pitchers in first-strike percentage (73.3%). Despite these exceptional numbers, Scherzer was often the victim of poor hitting support, compiling only a 14–12 record. On May 11, 2016, Scherzer struck out 20 Detroit Tiger batters, his former team, to tie the record for strikeouts over nine innings in a single game, held by Roger Clemens (twice), Randy Johnson, and Kerry Wood. Scherzer became the first pitcher to strike out 20 batters in a regulation game in the 21st century. He accomplished the feat and earned the win in a matchup with former Nationals teammate Jordan Zimmermann; the final score was 3–2. Scherzer joined Johnson as the only pitchers to have performed both a 20 strikeout game and a no-hitter during their careers. Nine of the strikeouts ended on three-pitch at bats. Of 119 total pitches discharged, 96 were for strikes; Scherzer did not deliver more than 16 in any inning. It was the first time in history that in any game of 125 or fewer pitches delivered, 96 or more were strikes. It was the third occasion that Tiger manager Brad Ausmus was on the losing the side of a 20-strikeout game; the first two were as a player. It was also Scherzer's first career victory versus Detroit, positing him as the 17th hurler to earn a win against all 30 MLB teams. On July 8, 2016, Scherzer was named to the National League squad at the All-Star Game in San Diego as roster replacement for teammate Stephen Strasburg, who was recently activated from the DL. Scherzer performed in relief in the sixth inning, allowing no baserunners. His aggregate season batting achievements included a career-best 12 RBI, which ranked second among major league pitchers to Adam Wainwright with 18. Scherzer was named the National League Cy Young Award winner on November 16, 2016, winning his second Cy Young Award on the strength of a 20–7 record, 2.96 ERA, MLB-leading 284 strikeouts, and an MLB-leading 0.968 WHIP. He became just the sixth pitcher in Major League Baseball history to win the award in both the American and the National Leagues. He won two of the 2016 Esurance MLB/This Year in Baseball Awards: for Best Pitcher, and his 20-strikeout game was singled out for Best Performance. Having sustained a stress fracture in a knuckle of his right ring finger prior to the 2017 season, Scherzer was unavailable to start Opening Day for the Nationals. He navigated a delayed start to spring training and missed the World Baseball Classic. Nonetheless, he avoided spending any time on the disabled list to start the season. On May 14, 2017, he pitched his first career immaculate inning, striking out César Hernández, Odubel Herrera, and Aaron Altherr on nine pitches in the fourth inning versus Philadelphia. It was the 84th immaculate inning in the major leagues, and second in Nationals' history, following Zimmermann's versus the Florida Marlins in 2011. In a 2–1 win versus the Dodgers on June 6, Scherzer struck out 14. He obtained the first 10 outs of the game via strikeout in spite of his own throwing error on a pickoff attempt, two walks allowed, and a passed ball by Matt Wieters. On June 11, Scherzer became the third-fastest pitcher to reach 2,000 strikeouts (after Nolan Ryan and Clayton Kershaw) by striking out Nomar Mazara of the Texas Rangers. Scherzer also reached the 2,000 plateau in the third-fewest innings (1,784), behind Pedro Martínez (​1,711 1⁄3) and Randy Johnson (​1,733 1⁄3). Scherzer attained ​7 1⁄3 no-hit innings versus the Marlins on June 21 until A. J. Ellis hit a comebacker that tipped off Scherzer's glove and trickled toward shortstop Trea Turner for Miami's first hit. Scherzer had struck out 11 and allowed one walk to that point in the contest. He won the NL Pitcher of the Month Award for June, allowing 14 hits and four earned runs for a 0.99 ERA over the course of ​36 1⁄3 innings through five starts. His record was 3–2 and he struck out 51 for an average of 12.63 per nine innings. Named to his fifth MLB All-Star Game, Scherzer was NL manager Joe Maddon's selection as the squad's starting pitcher, making him the oldest starter in that lineup. He became the fifth pitcher to start at least one All-Star Game for both the American and National Leagues. At the time of his selection, he consolidated a 10–5 record and an NL-leading both of a 2.10 ERA and 173 strikeouts. Played at Marlins Park in Miami, he tossed 15 pitches over one scoreless inning and struck out Aaron Judge and George Springer. On August 1, Scherzer hit his first career home run, a three-run blast off Chris O'Grady of the Marlins, but left the game shortly thereafter with neck spasms. The neck issued recurred, and the club placed Scherzer on the disabled list for the first time since 2009, retroactive to August 15. He was then removed from his next start on August 18 against the San Diego Padres at Petco Park as the neck issue recurred. Scherzer returned to the rotation on August 28, earning a win against the Marlins. On September 19, Scherzer carried out 250 strikeouts for the fourth consecutive season, phasing into the fourth pitcher in major league history to do so, following Ferguson Jenkins, Randy Johnson, and Pedro Martínez. Scherzer rebounded from an 8–2 loss with seven runs and six walks allowed to Atlanta in his previous start, to strike out seven and with five hits and one walk allowed over seven innings in a 4–2 win, also against Atlanta. In 2017 he was 16-6 with a 2.51 ERA. He led the majors in giving up the lowest percentage of hard-hit balls (26.5%). End of season awards for Scherzer included selection as a starting pitcher on Baseball America's All-MLB Team. Scherzer also won the 2017 National League Cy Young Award—his third—making him the tenth pitcher in history to win at least three. He was the Players Choice Award winner for National League Outstanding Pitcher, the second of his career. He was also elected to the Arizona Fall League Hall of Fame in late 2017, along with Mike Trout and David Wright, and had his number 51 jersey retired by the Scottsdale Scorpions. His AFL achievements included a 2.13 ERA in eight games in 2017 and a 3.38 ERA over four starts in 2008. Prior to the 2018 season, Sports Illustrated graded Scherzer as the top pitcher, and fourth-best overall player in baseball, following Trout, José Altuve, and Kris Bryant. In his first 98 starts with the Nationals from 2015–17, Scherzer accumulated the most innings, strikeouts, and pitching WAR. He initiated a contest with at least five hitless innings 11 times, including successfully concluding two no-hitters. He made his third Opening Day start for Washington and struck out seven consecutive Cincinnati Reds batters on the way to a 2−0 win. His ten batters struck out overall set a club Opening Day record. While playing Atlanta on April 9, he pilfered his first career base in the seventh inning, versus pitcher Peter Moylan and catcher Kurt Suzuki. On the mound, Scherzer gained a complete game shutout, the fifth of his career. He struck out 10 and allowed two hits and no walks. He earned the NL Pitcher of the Month Award in April while leading the league in strikeouts (57) and wins (4), and ranking fourth in each of ERA (1.62), WHIP (.082) and opposing batting average (.165). On May 6, Scherzer emerged as the first pitcher in major league history to produce 15 strikeouts in one game in ​6 1⁄3 innings (19 outs) or fewer, doing so versus the Philadelphia Phillies. Twelve consecutive outs occurred vía strikeout, including striking out the side in the third, fourth, and fifth innings. It was the second-longest such streak in major league history, his fifth career 15-strikeout game, and the 69th with at least 10. He made his following start versus the Arizona Diamondbacks, where he struck out 11 batters and hit an RBI double for the go-ahead run in the fourth inning that furnished a 3–1 Nationals victory. In a May 19 start versus the Dodgers, Scherzer struck out 13, including dispatching his 100th of the season in 63 innings. It eclipsed Kerry Wood's record for fewest innings to reach 100 strikeouts with ​65 2⁄3 realized in 2001. Still, the Nationals lost the game, 4–5, off a blown save by Sean Doolittle. With a 2–0 win over Baltimore on May 30, Scherzer procured career win number 150, while striking out 12 over eight shutout innings. He was named the NL Pitcher of the Month for the month of May—his second consecutive monthly award—after going 4–0 with a 2.21 ERA and a league-leading 63 strikeouts. Entering as a pinch hitter in the 14th inning on June 2 versus the Braves, Scherzer singled for his first career pinch hit and scored the go-ahead run on a triple by Wilmer Difo in a 5–3 victory. In the June 5 contest versus the Tampa Bay Rays, Scherzer settled his second career immaculate inning, striking out Johnny Field, Christian Arroyo and Daniel Robertson in the sixth inning. He advanced into one of five major league pitchers to have recorded more than one in their careers, joining Lefty Grove, Randy Johnson, Nolan Ryan, and Sandy Koufax. Scherzer allowed both runs as earned, five hits, and finished with 13 strikeouts as the Nationals won 4–2, improving his record to 10–1, the first in the major leagues with 10 wins. In a span of four following starts, Scherzer lost three times as the Nationals' offense was shut out each time. He lost another outing, 4−3, to the Boston Red Sox on July 2 while collecting his 1,000th strikeout since joining Washington. That vested him as the 11th pitcher in major league history to reach 1,000 strikeouts with two different clubs. He was selected as the NL starting pitcher in the All-Star Game, played at Nationals Park, for his third starting assignment. After allowing a home run to Aaron Judge, Scherzer became the third All-Star Game starter within the previous 30 years to strike out at least four batters. He procured his 200th regular season strikeout in 2018 on July 27 versus the Marlins, retiring Justin Bour with a swinging strikeout, to gridlock with Walter Johnson and Roger Clemens with seven consecutive seasons of 200 or more strikeouts. The three trailed Seaver as the all-time leader with nine consecutive seasons. On August 12, Scherzer pitched 7 strong shutout innings, striking out 11 while giving up just three hits and one walk during a primetime night game at Wrigley Field. Once again however, he was awarded a no decision. Up 3-0 in the bottom of the ninth, Nationals pitcher Ryan Madson hit two batters and gave up an infield single before issuing a "golden homer" - a 2 out, 2 strike, walk-off grand slam to Cubs rookie David Bote. After the game Scherzer spoke on the loss, saying "I mean, it's a gut punch". 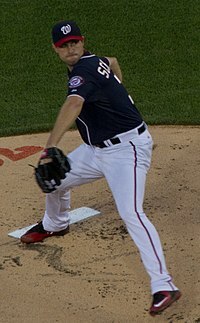 On September 25, Scherzer reached 300 strikeouts on the season, striking out Austin Dean of the Miami Marlins in a 10-pitch at-bat in the seventh inning of a 9–4 Nationals win. For the 2018 season, Scherzer was 18-7 with a 2.53 ERA. He threw 3,493 pitches, more than any other major league pitcher. He finished second in Cy Young Award voting, behind Jacob deGrom. Scherzer started for the Nationals on Opening Day against deGrom. Max Scherzer was initially going to play for Team USA in the 2017 World Baseball Classic. However, in early January 2017 it was reported that he would not play in the tournament after suffering a stress fracture in the knuckle of his right ring finger. He was replaced by teammate Tanner Roark. He's definitely a different breed, always has been. Just seeing the way he goes about things. He's a machine. Max goes to a different level with everything: hitting, baserunning, pitching, all facets of the game. With a low three-quarters delivery (nearly sidearm) Scherzer throws five pitches: a four-seam fastball with good movement averaging 92–96 mph (topping out at 99 mph), a slider at 85–86 mph, a changeup at 84–85 mph, a cutter at 88–89 mph and a curveball at 78–79 mph. He primarily uses a fastball-slider combination against right-handed hitters and a fastball-changeup-cutter combination against left-handed hitters. Occasionally, he also throws a curveball for the first strike in an at-bat. Scherzer has been nicknamed "Mad Max" due in part to a perceived higher-than-normal intensity during game play, and unusual and extensive preparation techniques. He also prepares intently on other aspects of the game, including hitting and baserunning. According to Nationals manager Dave Martinez, Scherzer differentiated himself from other major league pitchers because of his focus on hitting in addition to the work on his pitching. As of August 6, 2018, his batting average as a pitcher (.283) on the season was second-best at his position in the National League to Germán Márquez (.350). †—Awarded to one player in the major leagues. *—Awarded for play in National League from 2008–09, and 2015–present; and for play in American League, from 2010–14. Per Baseball-Reference.com. Through 2017 season. Awarded for play in National League from 2008–09, and 2015–present; and for play in American League, from 2010–14. Scherzer met his future wife, Erica May, at the University of Missouri, where both were pitchers. May pitched for the Mizzou softball team before a heart condition forced her to stop playing. The couple married in November 2013, shortly after the end of the Detroit Tigers season, after more than eight years of dating. In November 2017, they welcomed a daughter, Brooklyn May-Scherzer. The family resides in McLean, a suburb of Washington, D.C., in Northern Virginia. They own four rescue dogs and two cats. The Scherzers are socially active. In 2013, they partnered with the Detroit Tigers Foundation on a program called Scherzer's Superstars, in which groups from the Metropolitan Detroit chapter of Big Brothers Big Sisters of America were invited to Comerica Park every Tuesday home game to meet Scherzer and some of his Detroit teammates and go down to the field for batting practice. In 2015, after her husband signed with the Washington Nationals and inspired by the actions of his future teammate Sean Doolittle and Doolittle's future wife, activist and sports journalist Eireann Dolan, Erica May-Scherzer partnered with organizers of the Nationals' annual "Night Out" event for LGBT fans and led an effort by Nationals' spouses to promote the event. May-Scherzer is an ambassador for the Polaris Project, which aims to stop human trafficking; Scherzer started a fundraiser during the Nationals' 2016 season called Strike Out Modern Slavery in which the couple matched donations to Polaris for every strikeout Scherzer threw that season. Both Max and Erica are also involved with the Humane Rescue Alliance, announcing after Hurricane Harvey in August 2017 that they would personally cover all pet adoption fees from the Washington, D.C.-based group's shelters for four days. Scherzer's younger and only brother, Alex, died by suicide early in the summer of 2012. Alex had a passion for analyzing advanced baseball statistics or sabermetrics. Scherzer learned the value of sabermetrics from his brother, and he implements this as a tool to improve his game. Since Alex's death, Scherzer dedicates every start to his late brother. Scherzer has heterochromia iridum; his right eye is blue and his left eye is brown. On June 12, 2011, the Detroit Tigers distributed a bobblehead doll depicting Scherzer, with the condition correctly portrayed. In the spring of 2017, the Nationals unveiled a "delightfully creepy" crop of Scherzer's eyes, correctly portrayed as blue and brown, with backward and forward Ks photoshopped into the pupils. Wikimedia Commons has media related to Max Scherzer. ^ a b c "Max Scherzer joins rare company with second no-hitter of 2015". ESPN. October 3, 2015. Retrieved October 3, 2015. ^ Gregorian, Vahe (July 14, 2013). "Coping Mechanism". The Kansas City Star. Roopstigo.com. Retrieved July 11, 2015. ^ a b Janes, Chelsea (July 14, 2018). "Max Scherzer wasn't predestined for baseball greatness but has a hard-earned Hall of Fame case". The Washington Post. Retrieved July 14, 2018. ^ Trezza, Joe (May 31, 2018). "Cards originally picked hometown kid Scherzer: Club took righty, who honored commitment to Missouri, in 43rd round in 2003". MLB.com/Cardinals. Retrieved July 14, 2018. ^ a b "Six chosen for University of Missouri Athletics Hall of Fame". KTVO-TV. January 9, 2012. Retrieved January 10, 2012. ^ Rosenthal, Ken (March 10, 2017). "Why Max Scherzer is a true rarity among baseball's best pitchers". Fox Sports. Retrieved June 23, 2018. ^ "Diamondbacks sign first-round pick Scherzer". ESPN.com. Associated Press. May 31, 2007. Retrieved July 22, 2015. ^ Baseball America Prospect Handbook 2009. Durham, North Carolina: Baseball America Inc. 2009. p. 15. ^ a b Ketchum, Don (April 30, 2008). "Scherzer to make 1st start Monday". Azcentral.com. Retrieved October 9, 2011. ^ Falkoff, Robert (September 25, 2008). "Wainwright secures winning season". mlb.com. Retrieved June 19, 2013. ^ Hoch, Bryan (December 9, 2009). "Granderson joins Yanks in three-way trade". Yankees.MLB.com. Retrieved October 9, 2011. ^ Nightengale, Bob (July 16, 2018). "All-Star Game: Max Scherzer, Justin Verlander take different paths to historic dominance". USA Today. Retrieved August 7, 2018. ^ "Detroit Tigers team history & encyclopedia". Baseball-Reference.com. Retrieved August 7, 2018. ^ Beck, Jason (May 16, 2010). "Sizemore, Scherzer optioned to Triple-A: Guillen to play second base on return from DL". MLB.com. Retrieved May 16, 2010. ^ "Tampa Bay's Matt Garza throws the fifth no-hitter of 2010". Fox Sports. October 20, 2016. Retrieved June 9, 2018. ^ Kornacki, Steve (September 1, 2010). "Max Scherzer's strong outing wasted as Tigers again fall to Twins". MLive.com. Retrieved June 9, 2018. ^ "Max Scherzer statistics and history". Retrieved July 1, 2013. ^ "Max Scherzer strikes out 15 but falls 1 short of Tigers record". ESPN.com. Associated Press. May 20, 2012. Retrieved July 1, 2013. ^ "Year-by-Year Top-Tens Leaders & Records for Strikeouts". Baseball-Reference.com. Retrieved July 1, 2013. ^ Monagan, Matt (June 19, 2018). "When did Max Scherzer become the best pitcher in the world?". MLB.com. Retrieved June 21, 2018. ^ "2012 Detroit Tigers statistics". Baseball-Reference.com. Retrieved June 21, 2018. ^ "San Francisco Giants (4-0) 4, Detroit Tigers (0-4) 3". MLB.com. October 28, 2012. Retrieved June 21, 2018. ^ "Detroit's Scherzer moves to 11–0 as Tigers rout Boston". June 22, 2013. Retrieved July 1, 2013. ^ "Scherzer remains unbeaten, beats Rays to improve to 12-0". June 28, 2013. Retrieved July 1, 2013. ^ "Max Scherzer becomes first pitcher since 1986 to start season 13-0". June 28, 2013. Retrieved July 4, 2013. ^ "Scherzer suffers first loss of season, Rangers rout Tigers". July 13, 2013. Retrieved July 15, 2013. ^ "Matt Harvey, Max Scherzer on hill". July 15, 2013. Retrieved July 15, 2013. ^ Iott, Chris (August 8, 2013). "Detroit Tigers' Max Scherzer picks up career strikeout No. 1,000 in first inning against Indians". Retrieved May 16, 2014. ^ "Scherzer's gritty effort in duel nets win No. 19". MLB.com. August 24, 2013. ^ "Scherzer secures No. 20 as Tigers cut magic number". MLB.com. September 20, 2013. ^ "Stellar season earns Scherzer AL Cy Young Award". MLB.com. November 13, 2013. ^ a b "Players Choice Awards". Players Trust.org. Retrieved June 16, 2018. ^ a b "Baseball Digest Pitcher of the Year Award". Baseball Almanac. Retrieved June 16, 2018. ^ "Max Scherzer strikes out 11 as Tigers take Game 1 of ALDS". ESPN.com. Associated Press. October 5, 2013. ^ Caple, Jim (October 5, 2013). "Run support no big deal for Scherzer". ESPN.com. Retrieved May 17, 2014. ^ "Tigers rally late, hold off A's to force Game 5 in ALDS". cbssports.com. October 8, 2013. Retrieved October 9, 2013. ^ "Ortiz hits grand slam as Red Sox sting Tigers to tie up ALCS". CBS Sports.com. October 14, 2013. ^ "2013 ALCS: Boston Red Sox over Detroit Tigers (4–2)". Baseball-Reference.com. Retrieved August 7, 2018. ^ Perry, Dayn (January 17, 2014). "Tigers sign Max Scherzer for 2014, avoid arbitration". CBS Sports.com. Retrieved January 17, 2014. ^ "Cabrera picks up Scherzer to lead Tigers past Twins". CBS Sports.com. May 10, 2014. Retrieved May 19, 2014. ^ "Scherzer shuts down Astros; Tigers win sixth straight". CBS Sports.com. May 5, 2014. Retrieved May 6, 2014. ^ Jaffe, Jay (June 13, 2014). "Tigers beat White Sox as Max Scherzer tosses first career complete game". Sports Illustrated. Retrieved June 9, 2018. ^ "All-Stars unveiled, including 25 first-timers". MLB.com. July 6, 2014. Retrieved July 8, 2014. ^ "Former Logger Max Scherzer wins 2014 MLB All-Star Game". NorthwoodsLeague.com. July 16, 2014. Retrieved June 14, 2018. ^ McCosky, Chris (September 26, 2014). "Tigers' Max Scherzer pleased with his encore season". The Detroit News. Retrieved September 26, 2014. ^ Slonksnis, Catherine (September 27, 2014). "The 2014 season was a worthwhile investment for Max Scherzer". Yahoo! Sports. Retrieved September 27, 2014. ^ "Orioles set postseason team record with 12 runs in Game 1 win". ESPN.com. Associated Press. October 2, 2014. Retrieved October 3, 2014. ^ Ladson, Bill (January 21, 2015). "Scherzer has 7-year, $210M deal with Nats". Nationals.MLB.com. Retrieved January 21, 2015. ^ "Nationals land RHP Max Scherzer". ESPN.com. January 19, 2015. Retrieved January 21, 2015. ^ "Lots of numbers: Inside Max Scherzer's huge contract". Detroit Free Press. January 22, 2015. Retrieved January 22, 2015. ^ "Final years of Scherzer pact deferred". ESPN. January 22, 2015. Retrieved January 22, 2015. ^ Calcaterra, Craig (April 6, 2015). "Scherzer's Nationals debut doesn't go well as expected". NBC Sports. Retrieved April 7, 2015. ^ Rosiak, Todd (June 14, 2015). "Max Scherzer close to perfect vs. Brewers". Milwaukee Journal Sentinel. Retrieved June 14, 2015. ^ a b Canelas, Nick (October 3, 2015). "Max Scherzer achieves second-highest Game Score of all time in no-hitter". The Sporting News. Retrieved May 20, 2018. ^ SI Wire (June 20, 2015). "Did Jose Tabata lean in, ruin Max Scherzer's perfect game?". Sports Illustrated. Retrieved June 20, 2015. ^ a b Wagner, James (June 20, 2015). "Nationals Max Scherzer throws no-hitter after hit-by-pitch spoils perfect game". The Washington Post. Retrieved June 20, 2015. ^ Schoenfield, David (June 20, 2015). "Max Scherzer now the best pitcher in the game". ESPN.com. Retrieved June 20, 2015. ^ McKinley, Eric García (June 21, 2015). "Max Scherzer's run has been historic and charged with emotion". SBNation. Retrieved June 21, 2015. ^ Johnson, Chris (June 27, 2015). "Max Scherzer dominates Phillies for 100th career win". Mid-Atlantic Sports Network. Retrieved May 20, 2018. ^ Boswell, Thomas (September 9, 2015). "No one is more puzzled by Max Scherzer's collapse than Max Scherzer". The Washington Post. Retrieved September 9, 2015. ^ a b Janes, Chelsea (July 2, 2015). "Max Scherzer named National League pitcher of the month for second straight month". The Washington Post. Retrieved May 20, 2018. ^ SI Wire (July 11, 2015). "Nationals' Max Scherzer will not be available for All-Star Game". Sports Illustrated. Retrieved June 13, 2018. ^ Reddington, Patrick (September 14, 2015). "Nationals' starter Max Scherzer shuts Marlins down, snaps seven-start winless streak". SB Nation Federal Baseball. Retrieved June 28, 2018. ^ Cassavell, A. J. (October 4, 2015). "Was Scherzer's no-no the best ever?". Sports on Earth. Retrieved October 4, 2015. ^ Brown, David (October 3, 2015). "Was Max Scherzer's no-hitter vs. Mets the most dominant ever?". CBS Sports. Retrieved October 4, 2015. ^ a b c d Schoenfield, David (October 3, 2015). "Max Scherzer just pitched one of the greatest games of all time". ESPN.com. Retrieved October 4, 2015. ^ a b Ladson, Bill (November 20, 2015). "Scherzer's historic no-no is Best Performance: Gem vs. Mets wins Esurance MLB Award for Nats right-hander". MLB.com. Retrieved June 16, 2018. ^ "Pitcher Strikeout to Walk Ratio Leaders: 2015 MLB Season". sportingcharts.com. Retrieved January 24, 2017. ^ Strang, Katie (May 11, 2016). "Tigers unable to solve former teammate Max Scherzer". ESPN.com. Retrieved May 11, 2016. ^ a b Stephen, Eric (May 11, 2016). "Max Scherzer ties MLB record with 20 strikeouts against Tigers". SB Nation. Retrieved May 11, 2016. ^ Perry, Dayn (May 12, 2016). "Here are 20 stats to know about Max Scherzer's 20-strikeout game". CBS Sports.com. Retrieved June 10, 2018. ^ McCosky, Chris (May 11, 2016). "Scherzer strikes out record-tying 20 to beat Tigers". Detroit News. Retrieved May 11, 2016. ^ a b Collier, Jamal (July 13, 2016). "Scherzer hits 99 three times in All-Star Game: Amped-up Nats ace joins Harper, Murphy, Ramos as NL standouts". MLB.com. Retrieved June 10, 2018. ^ "Sortable player stats—2016—pitchers—RBI". MLB.com. Retrieved May 20, 2018. ^ a b Footer, Alyson (November 18, 2016). "Grand finale: MLB Awards put cap on season: Trout is Best Major Leaguer; Indians, Cubs win big". MLB.com. Retrieved November 19, 2016. ^ a b Collier, Jamal (November 18, 2016). "Scherzer wins MLB Awards for Best Pitcher, Performance". MLB.com. Retrieved May 12, 2018. ^ NBC Sports Washington (March 22, 2017). "Nationals Ace Max Scherzer will not be team's Opening Day Starter". NBC Sports Washington. Retrieved May 14, 2017. ^ a b Borek, Jesse (May 14, 2017). "Max Scherzer throws second immaculate inning in Nationals history". FanRag Sports Network. Retrieved May 14, 2017. ^ Plunkett, Bill (June 6, 2017). "Max Scherzer strikes out 14 as Dodgers lose to Nationals, 2–1". Orange County Register. Retrieved June 9, 2018. ^ a b Stats AP (June 12, 2017). "Scherzer gets to 2,000 Ks, but Rangers beat Nationals 5-1". CBSsports.com. Retrieved June 12, 2017. ^ Woo, Jeremy (June 21, 2017). "Nationals' Max Scherzer loses no-hitter in eighth on fluky hit". Sports Illustrated. Retrieved June 9, 2018. ^ a b Castillo, Jorge (July 3, 2017). "Max Scherzer named National League Pitcher of the Month". The Washington Post. Retrieved June 9, 2018. ^ a b Nightengale, Bob (July 10, 2017). "All-Star start shows Max Scherzer is, right now, the game's best pitcher". USA Today. Retrieved June 3, 2018. ^ Janes, Chelsea (July 12, 2018). "Max Scherzer muttered, Bryce Harper commentated, and Daniel Murphy hit: Nats impress at the All-Star Game". The Washington Post. Retrieved June 3, 2018. ^ Collier, Jamal (August 1, 2017). "Max Scherzer hits first career HR, then leaves with neck spasm". MLB.com. Retrieved August 1, 2017. ^ Castillo, Jorge (August 18, 2017). "Nationals ace Max Scherzer placed on DL with neck inflammation". The Washington Post. Retrieved August 18, 2017. ^ a b "Max Scherzer fourth pitcher with 4 straight 250-strikeout seasons". USA Today. Associated Press. September 19, 2017. Retrieved June 9, 2018. ^ a b "Back-to-back: Nationals' Max Scherzer wins 2nd consecutive Cy Young, 3rd overall". BBWAA.com. November 15, 2017. Retrieved November 15, 2017. ^ Kelly, Matt; Simon, Andrew (November 15, 2017). "History in making? Breaking down Cy Young field". MLB.com. Retrieved November 25, 2017. ^ a b "Max Scherzer, Ryan Zimmerman win Players Choice Awards". The Washington Times. Associated Press. November 8, 2017. Retrieved June 16, 2018. ^ Boor, William (November 2, 2017). "Scherzer inducted into AFL Hall of Fame: Nats ace joined by Angels' Trout, Mets' Wright in Fall League's 2017 Class". MLB.com. Retrieved June 21, 2018. ^ Coller, Jamal (March 30, 2018). "Scherzer K's 7 straight in Opening Day win: Two-time defending NL Cy Young ties team record of 10 strikeouts in opener". MLB.com. Retrieved March 30, 2018. ^ ESPN (April 9, 2018). "Max Scherzer caps complete-game shutout with first career stolen base". ESPN.com. Retrieved May 12, 2018. ^ Kramer, Daniel (May 2, 2018). "Manaea, Scherzer named Pitchers of the Month". MLB.com. ^ a b Lott, Thomas (May 6, 2018). "Max Scherzer gets 12 straight outs by strikeout in 15-K performance". The Sporting News. Retrieved May 12, 2018. ^ Quillen, Ian (May 6, 2018). "Max makes history while fanning 15 Phillies: Nationals ace tallies most strikeouts ever in 19 outs or fewer". MLB.com. Retrieved May 12, 2018. ^ Magruder, Jack (May 12, 2018). "Max (11 K's, go-ahead hit) magnificent for Nats". MLB.com. Retrieved May 12, 2018. ^ a b Collier, Jamal (May 19, 2018). "Nats foiled in 9th after Max's dominant start: Scherzer fans 13, fastest ever to 100 K's in a season". MLB.com. Retrieved May 20, 2018. ^ Castillo, Jorge (May 30, 2018). "Max Scherzer stifles Orioles as Nats' sixth straight win lands them in first". The Washington Post. Retrieved June 1, 2018. ^ Collier, Jamal (June 2, 2018). "Scherzer wins 2nd Pitcher of Month award of '18". MLB.Nationals.com. Retrieved June 2, 2018. ^ a b Zuckerman, Mark (June 2, 2018). "Scherzer wins another NL Pitcher of the Month award". Mid Atlantic Sports Network. Retrieved June 2, 2018. ^ Reineking, Jim (June 2, 2018). "Max Scherzer's clutch hit lifts Washington Nationals to win over Atlanta Braves in 14th". USA Today. Retrieved June 2, 2018. ^ Coller, Jamal (June 2, 2018). "Scherzer sparks Nats rally to beat Braves in 14: Ace delivers pinch-hit single, scores go-ahead run from first on Difo's triple". MLB.com. Retrieved June 3, 2018. ^ a b Collier, Jamal (June 5, 2018). "Scherzer throws immaculate inning vs. Rays". MLB.com. Retrieved June 5, 2018. ^ a b Mather, Victor (June 6, 2018). "Immaculate inning: Yes, Max Scherzer is that good". The New York Times. Retrieved June 6, 2018. ^ Collier, Jamal (July 2, 2018). "Scherzer gets historic K in tough-luck loss". MLB.com. Retrieved July 3, 2018. ^ a b Washington Post Staff (July 18, 2018). "AL tops NL for sixth straight year in All-Star Game after impromptu home run derby". The Washington Post. Retrieved August 7, 2018. ^ Spencer, Clark (July 27, 2018). "Marlins receive a taste of the real Max Scherzer, and it wasn't pleasant". Miami Herald. Retrieved July 27, 2018. ^ "Cubs break Nationals' hearts with walk-off win that hasn't been seen in two decades". ^ Zuckerman, Mark. "One strike away, Nats lose another heartbreaker (updated)". ^ Collier, Jamal (September 26, 2018). "Scherzer hits 300 K's, earns 18th win". MLB.com. Retrieved September 26, 2018. ^ "Jonathan Lucroy to catch for Team USA in WBC". MLB.com. ^ Wells, Adam. "Max Scherzer Injury: Nationals SP Suffers Stress Fracture in Knuckle". ^ a b c Matz, Eddie (June 20, 2018). "The true madness of Max Scherzer". ESPN.com. Retrieved June 21, 2018. ^ "PitchFx » Overview". FanGraphs. Retrieved July 22, 2016. ^ "Max Scherzer » Statistics » Pitching - FanGraphs Baseball". ^ "PITCHf/x Player Card: Max Scherzer". BrooksBaseball.net. Retrieved April 29, 2012. ^ Kerr, Byron (August 7, 2018). "Scherzer's emphasis on hitting another phase to his unbeatable success". Mid Atlantic Sports Network. Retrieved August 7, 2018. ^ Kramer, Daniel (May 2, 2018). "Manaea, Scherzer named Pitchers of the Month". MLB.com. Retrieved May 12, 2018. ^ "MLB The Sporting News Pitchers of the Year & The Sporting News Major League Players of the Year". Baseball-Reference.com. Retrieved May 20, 2018. ^ a b Levine, Daniel (June 23, 2016). "Erica May-Scherzer, Max Scherzer's Wife: 5 Fast Facts You Need To Know". heavy. Retrieved December 3, 2017. ^ a b Steinberg, Dan (June 11, 2015). "For Erica Scherzer, supporting Nationals 'Night Out' event for LGBT fans is 'no-brainer'". The Washington Post. Retrieved December 3, 2017. ^ Clair, Michael (November 29, 2017). "Max Scherzer and his wife welcomed their baby, Brooklyn, to the world on Wednesday". MLB.com. Retrieved December 3, 2017. ^ a b McClain, Buzz (July 28, 2017). "Erica May-Scherzer settles in". Northern Virginia Magazine. Retrieved December 3, 2017. ^ Majoros, Kevin (June 11, 2015). "Players' wives to join LGBT fans for Night Out". Washington Blade. Retrieved December 3, 2017. ^ "Portrait of an Advocate: An Interview With Erica May Scherzer, Polaris Ambassador". Polaris Project. December 16, 2015. Retrieved December 3, 2017. ^ Bennett, JohnPaul (June 27, 2016). "Max Scherzer Strikes Out Modern Slavery & Human Trafficking During MLB Season". PledgeIt. Retrieved December 3, 2017. ^ Crowl, Jonathan (June 27, 2016). "How Washington's Max Scherzer Uses Strikeouts To Combat Modern Slavery". ThePostGame. Retrieved December 3, 2017. ^ Randall, Kayla (August 31, 2017). "Nationals Pitcher Max Scherzer and His Wife, Erica, Will Cover Adoption Fees at Humane Rescue Alliance This Weekend". Washingtonian. Retrieved December 3, 2017. ^ Beck, Jason (June 26, 2012). "Heavy-hearted Scherzer discusses brother's death". MLB.com. Retrieved August 14, 2014. ^ Sanchez, Robert (April 6, 2013). "Max Scherzer: A brother's passage". ESPN.com. Retrieved August 14, 2014. ^ Kaduk, Kevin (October 19, 2012). "Max Scherzer parties with custom mismatched goggles for his mismatched eyes". Yahoo! Sports. ^ Passan, Jeff (March 4, 2006). "Unmatched eyes of the Tiger". ^ Miller, Doug (July 7, 2014). "Did you know? 2014 All-Star fun facts". MLB.com. Retrieved August 14, 2014. ^ Allen, Scott (April 4, 2017). "Max Scherzer sign is a delightfully creepy addition to Nationals Park". WashingtonPost.com. Retrieved October 13, 2017.